The work is derived from a larger collection of over 4,000 intelligence documents from State Archives in Europe and North America from the inter-war period. The collection contains daily reports and correspondances between 1915 and 1943, forming a vast communication network in which the official traces and observations of the individual are cross-referenced to historical events, international personalities and geographic locations. 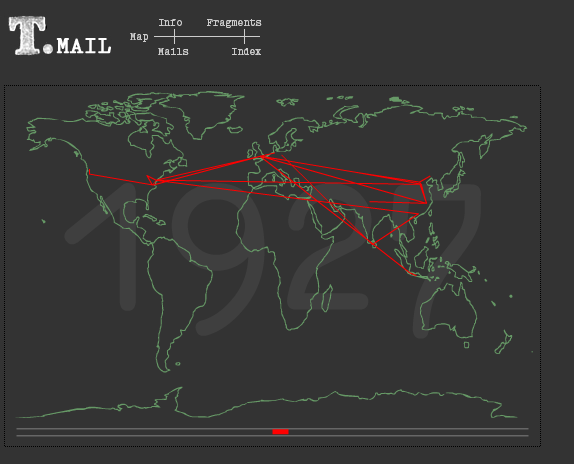 In the World-Wide-Web version called "T.Mail", a selection of hundreds of documents are available as navigatable HTML pages using the "Petal" browser developed by the Department of Culturual Studies at the University of Lüneburg. The information is available through multiple categorical menues, through marked text in the document scans, and through a flash geographic time-line display. In his installations, performances and media works, Dreyblatt creates complex textual and spatial metaphors for memory which function as a media discourse on recollection and the archive. His installations, public artworks and performances have been exhibited and staged extensively in Europe. "Dreyblatt's project, maintains its edge--and its importance for the rethinking of identity, history, culture, and memory--by refusing to retreat from or transcend [...] public, archival traces." - Jeffrey Wallen, Hampshire College. Among the second generation of New York minimal composers, Arnold Dreyblatt has developed a unique approach to composition and music performance. He has invented a set of new and original instruments, performance techniques, and a system of tuning. His compositions are based on harmonics, and thus just intonation, played either through a bowing technique he developed for his modified bass, and other modified and conventional instruments which he specially tuned. He originally used a steady pulse provided by the bowing motion on his bass (placing his music in the minimal category), but he eventually added many more instruments and more rhythmic variety. In 1925, Freud wrote a text that compares the faculty of memory to a child's toy known as a Wunderblock. It consists of a wax slab stretched with cellophane, upon which a text may be inscribed, and just as readily erased by lifting the cellophane layer up and away from the wax slab. In contrast to Freud's model, in which the pressure of the act of inscription onto the cellophane surface continues in the direction of the underlying layer of wax, in 'The Wunderblock', the original selection and entry of data has been concluded in the past. The movement originates from ROM and is held in RAM, before travelling up towards the surface. data projection, circular wire screen, sound, 1998 Black room, computer data projection, suspended wire mesh, sound equipment. Size variable. An automated writing and recitation machine is found in a darkened black space. One enters a three dimensional data architecture where the process of searching, sorting and locating words and the overlapping inter-textual linkages of information are simulated optically by metaphors of transparence and complexity. Projected onto a barely visible cylindrical screen are multiple transparent layers of continually flowing historical data, which appear to be suspended in the center of the space, and which delineate the room contours with textual landscapes. including Beijing, Berlin, and Chicago." "I listen to the surrounding environment and question: what have we lost, where are we going, how can an understanding of sound help us appreciate what remains?" Sebastiane Hegarty: a British artist, writer and lecturer whose recordings have featured on radio and film. John Grzinich: an American sound and video artist now living in Estonia, he also co-ordinates the MoKS residency program. Des Coulam: a British ex-pat living in Paris, he documents the many sounds of Parisian streets, arcades and subways. Vladimir Kryutchev: a Russian reporter and field-recordist who documents the sounds of local village life. Magnus Bergsson: an Icelandic field-recordist whose recordings focus on the urban and natural spaces of Iceland. Ian Rawes: a reporter and field-recordist for the London Sound Survey. David Velez: a Colombian field-recordist whose recent essay “El Coyote” is an immensely insightful and sensitive reflection on why he chooses to record the subjects that he does. Es erscheint naheliegend, dass die uns umgebenden Geräusche einen großen Einfluss auf den Menschen und seine Kultur ausüben und schon immer ausgeübt haben. Umgekehrt schafft der Mensch durch seine zivilisatorischen Aktivitäten das typische Klangbild seiner Umwelt. 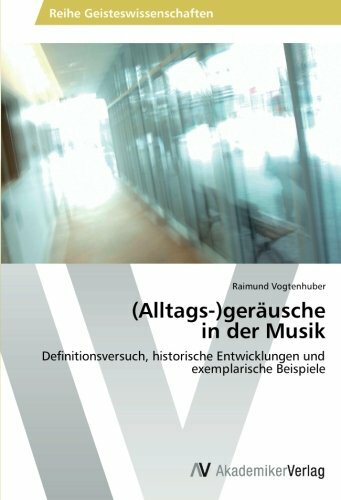 In dieser Arbeit wird das Phänomen des Geräusches, im speziellen des Alltagsgeräusches, und dessen Verwendung und Beziehung zur Musik untersucht. Der erste Abschnitt beschäftigt sich mit den grundlegenden physikalischen Eigenschaften des Schalls und versucht den Begriff des Geräusches im Allgemeinen und des Alltagsgeräusches im Speziellen zu definieren. Es folgen historische Beispiele wie die Geräuschmusik Luigi Russolos, die Musique concréte, das World Soundscape Projekt und Beispiele aus der populären Musik (Beatles) und der Improvisierten Musik (Fred Frith). Zuletzt folgt eine Beschreibung der eigenen Arbeit. An absurdly nerdy look at how hip hop invented the most important slang of our time.